It's always exciting when a book in a constructed language comes out in print, and this is no exception. Having actual books in print that can be purchased, put on your bookshelf or carried around is often the difference between appearing like an Internet hobby language, and coming across as a real language worth learning. The other good thing about this is that it's original literature as opposed to a translation of an already-known work in another language, and thus the only way to read these stories is in Interlingua. One other good thing about this is that Interlingua as a naturalistic IAL is a bit more prone to being changed on a whim by certain users depending on their mother tongue, and the more standardized literature there is the less likely it is that people will treat it as a project they can play around with as opposed to a real language. Le diligentissime autor italian Onofrio Notarstefano ha publicate duo nove libros in interlingua. The most diligent author Onofrio Notarstefano has published two new books in Interlingua. Le prime es un reedition, "Le contos del Bosco Ancestral in interlingua". Le 244 paginas es un collection de 37 contos re intolerantia, religiones e genocidios, re homines vincite e - multo - re cattos. Le libro es dedicate a un catto special, que ora non es, ma que, in un del momentos plus belle del vita del autor, le ha facite sentir anque se un catto. Le libro pote esser comprate ci: http://www.lulu.com/content/478801 pro 16,50 euros. The first is a re-edition of "The Stories of the Ancestral Forest in Interlingua". The 244 pages are a collection of 37 stories about intolerance, religions and genocides, victorious men and - many - about cats. The book is dedicated to a special cat, one no longer here, but which, in one of the most beautiful moments of the life of the author, had made him feel like a cat as well. The book can be purchased here: http://www.lulu.com/content/478801 for 16.50 euros. "Io ha nascite in Napoli e illac io ha passate quasi le totalitate de mi vita. Ora io habita alterubi. Un persona qui scribe non pote narrar de mundos que non ha essite le sues. Ma in iste breve contos io non ha volite narrar del gente de Napoli. Assi, pro me, Napoli, con su antique muros grec, ha essite solo un vacue theatro sin personages real, ubi io ha inserite personas inexistente, completemente inventate, fructo de mi phantasia." "I was born in Napoli and there I have passed almost the whole of my life. Now I live somewhere else. A person who writes cannot tell of worlds that have not been his own. But in these short stories I have not wished to tell of the people of Napoli. So, for me, Napoli, with its antique Greek walls, has been only an empty theatre without real people, where I have inserted nonexisting people, completely invented, fruits of my imagination." 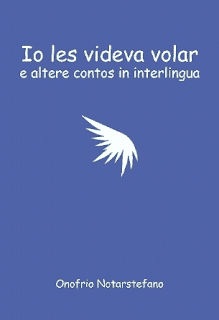 "Io les videva volar" pote esser comprate ci: http://www.lulu.com/content/4860966. "I saw them fly" can be purchased here: http://www.lulu.com/content/4860966. Onofrio Notarstefano ha traducite numerose pecias del litteratura mundial pro i.a. le magazin official del Union Mundial pro Interlingua, Panorama in interlingua, ille ha mesme scribite multe novellas, e ille ha contribuite anque al Bibliotheca electronic in interlingua. Ille prepara actualmente ancora un libro in interlingua. Onofrio Notarstefano has translated numerous pieces of world literature: among others the official magazine for the Union Mundial pro Interlingua (The World Interlingua Union) known as Panorama in interlingua, he has written a number of novels, and has also contributed to the Bibliotheca electronic in interlingua (electronic Interlingua library). He is now preparing another book in Interlingua.